The latest news from Ancients website. Hi guys, Travis Taliaferro submitted 6 new scenarios. Thank you Travis for your contributions. If you would like having a look to all maps created by Travis, then take a look at his "Designer Page" (Travis Taliaferro). Enjoy playing these CCA maps! I'm working on a "refresh / restyle / update" about CCA Vassal game module. added "report in log window" for marker actions like "attack" and "target"
added "Area of Effect" trait to see ranged combat max distance for bow, sliger (foot and cavalry) and war machines. Please follow the "work in progress" and post your suggestions on BGG Forum. the user "LeonardoAngelo" found some missing scenarios and I think it would be great for us to cover the gap. Let's see if there are some good scenario designer out there (I do know there are a lot of them) to create these missing scenarios. Here you can find a brief list. More details in the forum thread. Belove you can find direct download links. Again, Happy New Year 2018 and enjoy playing as usual! I've finally published 3 scenarios from Vae Victis magazine. Many thanks to Michal for sharing them. 2016-10-13 Added new tag "Playable with"
i've tried to restore a previously available filter / tag called "Playable with Base Game"
with this TAG you can group all scenarios that can be played with base game only (based on unit counts). Enjoy playing and don't forget to record each play stat! I've changed a little bit "top menu". I've also tried to introduce "Played Games" as a sort of "own played game record". Every users should see his own played games. Let me know if you'd like to have more details under this menu. Hi guys, with kind permission from Rodger B. MacGowan, I've just published 2 new EPIC maps taken from C3i Magazines #26. If you would like having a look to all maps from C3i Magazine, then click the name and see the "Designer Page". all material from C3i Magazine is Copyright ©Rodger B. MacGowan (RBM Publication)! under kind request of user Mark McG I've enabled PMS system also here on C&C Ancients website. You can simmply contact a user using the little "baloon" icon under his profile (inside FORUM). In case of problems, please report them on the Forum so that I can fix them ASAP. Enjoy gaming, playing and surfing. One of the (many) things we like about CCA is the HUGE number of official scenarios: just before Exp#4 brings us a lot more there have been 98!!! However, they are split into 4 booklets, 4 C3i journals, and 2 bonus packs, with often interlocking periods... So not very easy to choose one, or even go through a period without changing booklets (Exp#2 and #3 mostly, but also some battles in the period 260-200 BC and not in the Punic Wars, for example). I have gone through the list, and sorted them chronologically, with the battle name color-coded by the booklet, the armies by the blocks used, and the star indicating the historical victor. I had in mind the binder someone suggested at CSW, with pre-punched sleeves, so I scanned the scenarios for which I didn't have a pdf version (all expansions plus C3i), and now I have printed them and put them in sleeves into a binder. But once the scan part of the work was done, I thought that a nice bonus to the list could be obtained by adding a "stamp-like" icon with the battlefield, just big enough to get a rough idea of what the battle looks like, and the number of victory banners. Now you can look for a given period, or a terrain free battle, or a given number of banners (short/long battle) at a glance! READ MORE for detailed infos. I've published 4 new maps by Jim Duncan. If you like them, please, ask me for creating your own personalized UserBar. It's FREE. For those who still find a "1st Edition" CCA for sale somewhere, the original game had the dice stickers slightly too large to fit into the recessed portion of each dice. GMT quickly posted these as replacements. For easier reference, The Phalanx has been also added to "Variants Menu" on the left (CLICK HERE). 2009-04-21 News for Expansion4 "Imperial"
I've recently seen the sticker art for the purple Roman army and wanted to report a "nice touch" that is being included... if players do own the rest of the system (likely most purchasers) and want to do a side shuffle of sorts. The victory banners here are Roman eagles, with a gray background. If you remember, the base game Roman VBs had a red background. The Red Romans of RvB had VBs with a purple background. 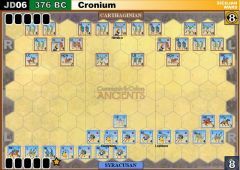 By giving a gray background VB to the purple Romans, those who wish for a little more literal alignment can swap VBs around in their armies-- so that each Roman army has VBs of it's own particular army background color. That's nice under any circumstances, but might be particularly nice if you're doing RCW type battles with two Roman armies fighting each other. In these days Miguel worked a lot on a restyle for his MM01 Thermopylae map. The other two ones, from Joe (X18) and Don (A10), treat the fighting on the wall in a too small scale to my taste, and the flanking around the mountains distracts from the battle itself. I made mine with the wall diagonal because I was afraid of doing a too big scale, with the wall going along the whole board. But then the retreat paths were awkward, the fighting was left-to-right, and the flanking force, though treated as the official ambushes, sometimes arrived too far from the Greeks. I made some tries, solo, with my brother, and sending some tests to Bevan, who tried it with his group and sent feedback! I have kept the starting cards, but left out the deck "clock", removing 20 cards was complicated (specially in VASSAL! ), I wanted only a few special rules but that gave the right flavour to the battle. 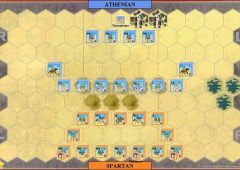 The ambush is now very effective; "300 Spartans vs 100 Nations" centers the fight around the Spartan HI, gives a better chance to the Persian, gives more importance to "Rally", and conveys the overwhelming Persian numbers without filling up the starting board. "Go Tell" introduces interesting choices at the beginning of each Greek turn. And no more elephants, Bevan thought that that was too "300 the movie" and that it introduced a too random element in the fight! Just published 4 new maps by Jim Duncan! Recently Bill Bennet posted on CCAvassal Yahoo Group! some news the new version (v 3.2) of famous C&CAncients module to play online using VassalEngine. Extension files fully compatible with version 3.2 of the C&C Ancient module are also available. In order to simplify downloading, you will find them assembled into a single archive file, named "CCAv3_ExtensionPack.zip". Unzip the file into an extension folder named for the v3.2 module, as appropriate to your system (i.e. "C&CAncientsv3_ext"). You can download it here: CCAncients_V3 and also Extensions. If you are searching for the "Italian Cards"... I'm working on it! Stay tuned. Thank you Bill for your great work! 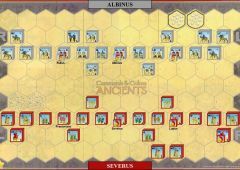 Commands & Colors: Ancients online game experience is even better with your new Vassal module!!! Moreover you will also find a complete scenario list HERE. Many thanks to GMT Games LLC and to Mr Tony Curtis (GMT Games LLC manager) for granting permission to publish all these materials. Recently Jim Duncan posted loads of new scenarios so I've decided to create a new CCA Vassal Module Extension to group them all and easily get them played online. Unzip the files into an extension folder named for the v3.2 module, as appropriate to your system (i.e. subdir "C&CAncientsv3_ext"). Thank you Jim for your hard work! 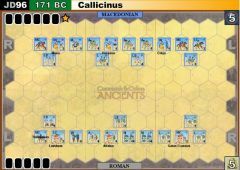 Recently Bill Bennet posted an incredible new module about C&CAncients EPIC, to play online using VassalEngine. You can download it here: C&CAncients_EPIC . Thank you Bill for your great work! 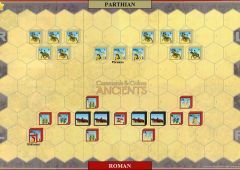 Commands & Colors: Ancients online EPIC game experience is finally "real" with your new Vassal module!!! I've also updated all Official scenarios about Epic Ancients II. I've just setup a new website module to show all scenarios from actual map category. If you enter in a specific scenario and scroll down at the bottom you'll find a section called "Maps in this Category". This section groups all scenarios from the actual map category in a more graphic way. This option is available in both scenario view and category view. It's also fully functional on mobile device! I've just published the latest scenario from Giulio! I'm also posting reference to the previous one because I haven't done it before. All scenarios from Giulio can be found here (or inside "scenario designer" section). another year passed by and we have to prepare for the brand new 2018! This website is a "one men" work so feel free to contribute in every way you decide using the PAYPAL icon on the top-right corner. C&C: Ancients Community is proud to welcome and enjoy a new Scenario Designer: Giulio Bottazzi. From now on you will find the complete list of his works in his "Designer Page". Welcome aboard Giulio and thank you for your submission. just to inform you that I've just completed the update of all armies in "Variants - Army List" category with all cross reference about enemies. After porting old website to the new platform I lost all armies internal links but now I've recovered them (adding army name too). Hoping for you to enjoy this new feature and let you easily choose your army when playing "Scenario X" variant. Don't forget to enjoy every game. C&C: Ancients Community is proud to welcome and enjoy a new Scenario Designer: Michaël Lagarde. Here under you can find his linked scenarios to recreate Alesia Battle. Welcome aboard Michaël and thank you for your submission. 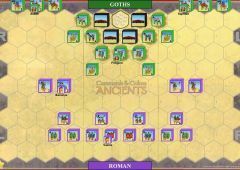 Hi guys and Welcome in this "fresh new" website dedicated to Commands and Colors: Ancients game by Richard Borg. A big thank you goes to Robert Koch for creating "Game Results" recording component. You can see it "in action" in each scenario page, with restored data from previous website. I've also restored Ancients Scenario Statistics webpage, linking it also on Top Menu, under Maps. Moreover I've added "Most Played" and "Last Played" visualization on Homepage bottom, adding a table style to better show values. For suggestions, reference, corrections or any other issue you can use the website FORUM. And here it comes the "Autumn Gift": 5 new scenarios, mostly from Sicilian Wars. Thank you Jim for submitting 5 new scenarios on commandsandcolors.net/ancients map database. Your contribution is awesome. If you would like having a look to all maps created by Jim, then click his name Jim Duncan and see his "Designer Page". Don't forget to update CCA Vassal extension with all his maps. I've published 5 new maps by Jim Duncan. 30.000 unique visits and 200.000 page views! To celebrate this great event I would like to propose an unique scenario, written by Jim Duncan and set in Issus (333 BC): JD60 The Thirty Thousands (333 BC). It's also available a new Extension that groups Jim Maps from JD41 to JD60. CLICK HERE to download it. Nowadays our Maps Archive counts 358 different Scenarios!!!!!! Many thanks to all Scenario Designer for help our map database growht. Under RULES MENU you will find a new ink called UNITS, where you will find detailed unit statistics plus some strategy guidelines. Under VARIANTS MENU you will find a new ink called CAMPAIGN SYSTEM, a system that lets you play multile scenarios linking them together (derived from an original idea by Leo Tischer). Comments and feedbacks are always welcome. You deserve much more than this, John. “I have been so busy designing and developing other games that I have been out of touch with this beautiful game, C&C Ancients. Your web site is magnificent. Thank you for using any of my previous materials and classifications and pulling them together in this simply SUPERB resource. I want to THANK YOU, because your meticulous work gave me the impetus to start this adventure. 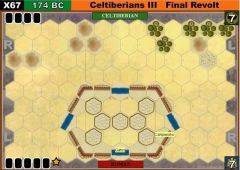 Thewargamer.com is the First Attack, commandsandcolors.net/ancients the Momentum Advance. Aaron Bell (a.k.a. 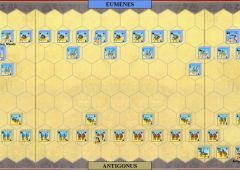 bestbandis on BGG) is back, publishing his hexless variant for Commands & Colors: Ancients!!! This is pretty much a straight conversion from the board game to a hexless, tabletop version. Use the normal unit stats and rules as written unless there is anything here that supersedes them. These rules are intended to keep the flexibility of the boardgame while making it look and play a little more like a classic tabletop rule set. For play you will need appropriate figures based on DBx-standard elements. 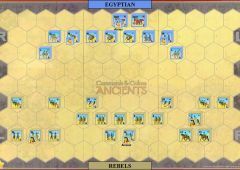 Units should be four elements in double-line if foot, three elements in wedge formation if cavalry, and two elements side by side if elephants, chariots or war-machines. Elements are not removed as casualties. Use markers to keep track of losses. For easier reference, HEXLESS VARIANT RULES has been added to "Variants Menu" on the left (CLICK HERE). In Download Area you will also find the original PDF by the author (CLICK HERE). Just published 5 new maps by Jim Duncan. 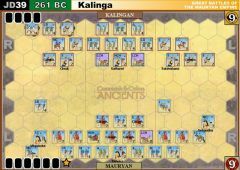 An online tournament using the Vassal C&C Ancients module. 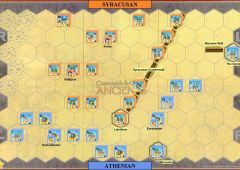 Commands & Colors Ancients is a board game designed by Richard Borg and published by GMT Games (http://www.gmtgames.com/), which allows you to re-fight epic battles of the ancient world. Vassal (http://www.vassalengine.org/) is a free software utility that allows you to play board games in real time over the internet. 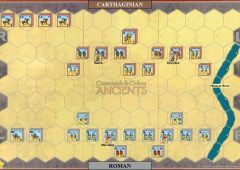 A module for playing C&CA is available from the Files section of its webpage on the Vassal website. The tournament is hosted on the C&CA Vassal Players Yahoo group (http://games.groups.yahoo.com/group/ccavassal/). It features two phases of play. In the first phase, players will be organized into a Swiss system draw for match play (playing both sides of a scenario against their assigned opponent in each round). In the second phase, the top eight players will be seeded in a single-elimination quarterfinals bracket to determine the ultimate champion. The full rules for the tournament can be found in the Files section of the Yahoo group. To sign up for the tournament, you will need to join the C&CA Vassal Players group and go to the Database section where you will enter your information in a tournament player database. Registration is open until October 25, 2009. Hi guys, this time Jim Duncan surprised us with 8 new maps that can even be played as a campaign: Judas Maccabaeus. You can read some scenario notes here. Moreover with these maps we have broken 4 hundreds scenario limit: our scenario archive now counts 405 MAPS!!!!! Just published 5 new maps taken from C3i Magazines #21 and #22.
recently Jim Duncan reviewed some of his "old scenarios" about Mauryan Empire. Finally I've updated all of them as noted by the author. Click Here to see these battles, and a big "Thank You" to Jim for the update.